What do you do with the 99% of your website visitors that leave your website? With Email Marketing, you can capture valuable traffic. 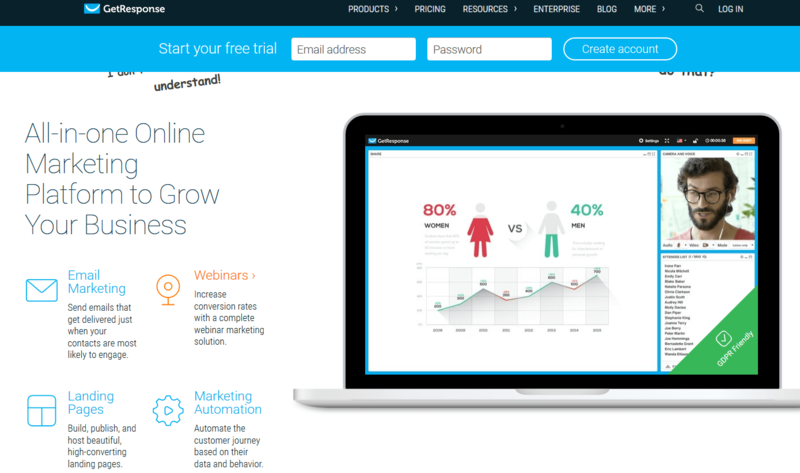 Check our these Email Marketing tools and tips by Lilian Sue. After covering content curation tools and fundraising ideas, I thought it was time to touch on email marketing tools that can help non-profits share content with a dedicated audience of supporters. Yes, a blog is vital to sharing stories about your organization and the passionate ambassadors you have on your team -but an e-newsletter goes one step further to keep your core audience of supporters and key donors up-to-date. Email marketing is one of the most affordable marketing tactics out there and it’s a great vehicle for personalized content marketing pieces that can establish your organization as a leader in the industry. Through the content you curate, you’ll be connecting with a pool of potential brand advocates who are already fans of your cause and who show their support through spreading the word about fundraising campaigns and donations. Below, you’ll find a toolkit of the types of e-mail content every non-profit needs to have in their arsenal and analyses of some of the affordable email marketing tools on the market. Events offer opportunities for non-profits to personally interact with potential donors and the larger community. From charity auctions to carnivals and summer camps, every non-profit is sure to have its own annual calendar of signature events, designed to raise brand awareness and donations. Big bold images related to the event help to capture the audience’s attention and engages them with the headline. Make sure to give subscribers all the Ws (when, where and why) details about the event in a way that makes it easy to read. Above all, make sure your call to action is bold and it stands out so that subscribers know exactly what you want them to do. 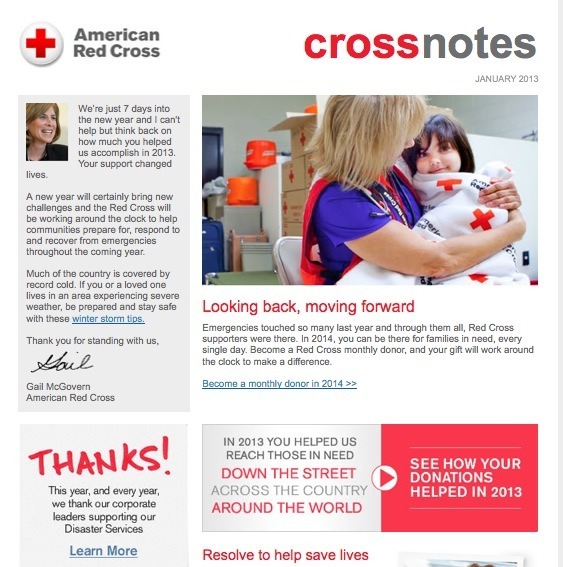 Keep volunteers to donors informed on a regular basis by sending them a newsletter. Sending them a newsletter that features news items such as a call for volunteers, photos from your last fundraising initiative, or spotlighting a new employee is a great way to keep them in the loop. Make sure that the design and format of the newsletter is visually appealing with great images and that it contains easy-to-to read blurbs and links back to your website & blog for further information. 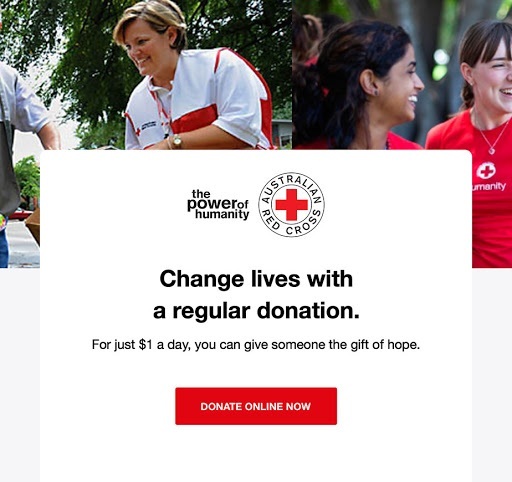 Email is responsible for nearly 1/3 of non-profits’ online fundraising revenue so knowing how to create an effective donation campaign email is vital. Be sure to generate an email template that has a clear call to action. In addition to having a clear call to action, make sure to have a short explanation that lets prospective donors know that even small donations can help and include a bright, eye-catching image of their contributions in action. It could be an image of volunteers helping at an event, children on your program participating in a day camp etc. Don’t just wait until the end of the year or towards Christmas to thank your supporters. With donation campaigns and fundraising events going year round, it’s important to show your appreciation on a regular basis. Personalize each ‘thank you’ email with their name and make sure to let your donors know that you’ll be sending them campaign updates and news on other events in the future. Not only should you make sure to include a clear call to action button that’s linked your donation page or blog, but your email needs to be properly formatted for mobile and on desktop. Also, make sure to create an attention-grabbing subject line to catch the attention of your email list so that they’ll open the email. Personalize the email to let prospective donors know that you care about their contributions and be clear & get to the point on what you want your audience to do-especially when it comes to soliciting donations. This email marketing tool offers non-profits a 15% discount as well as a 10% security discount when two-factor security authentication is added. When you first sign up for MailChimp, the system automatically starts you off on their Forever Free program, which allows you to send up to 12,000 emails/month to 2,000 subscribers. Once you move up to the Monthly plan (which your discounts can apply to) you can have up to 50,000 subscribers and an unlimited number of sends for campaigns. With their easy-to-use drag & drop campaign builder, you’ll be able to add images, text, video and all of your brand elements and use one of the 1000s of templates MailChimp has in their system. If you need help, MailChimp has an extensive library of FAQs and learning resources on everything from templates to building lists as well as 24/7 email & chat support. 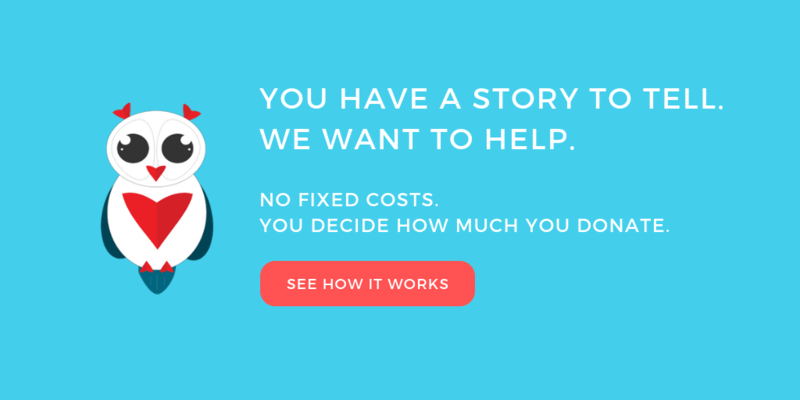 This e-mail marketing platform offers non-profits the first 3 months for free and then a 25% discount on invoices afterwards. The $19/month plan allows you to create a database of up to 500 subscribers, send unlimited emails with built-in analytics for your campaigns and gives you access to 700+ templates, 6,000+ stock photos. The $29/month plan lets you have up to 2,500 subscribers. No matter the plan you choose, you’ll be able to automatically create emails from your newest blog posts using RSS to email, generate mobile sign up forms, get access to 24/7 customer service and apply tags to trigger automated email campaigns based on clicks and opens. Benchmark offers a 25% discount to non-profits similar to AWeber but this platform also offers more varied plans. The free plan allows you to send up to 14,000 emails/month to 2,000 subscribers and gives you access to Google analytics tracking for your campaigns, RSS email and basic drip campaigns, email delivery management and their database of responsive templates. The paid plans, the most popular of which is the 1,000 subscribers with unlimited email sends per month at $21.99 USD/month, also automates your email follow-ups based on actions such as opens and clicks. It even has the power to track subscribers from your email campaigns to your website and automate follow up emails based on the pages they visit. You’ll also be able to split test subject lines and protect your subscriber lists by enabling password protection. Out of all the email marketing platforms profiled here, Get Response offers the largest discount to non-profits with 50% off the plan they choose. The email marketing beginners’ package is $15/month to send emails up to 1000 subscribers. You’ll be able to use one of the 500+ designed templates or create your own using the drag & drop or HTML code editors. You’ll also be able to use the stock image library to complete the professional look you want and edit your email campaigns in mobile preview so you’ll know that your campaigns will always be optimized. You can use autoresponders to automatically send out welcome messages at the start of a campaign and follow-ups, easily managed in a drag-and-drop organizer. Get Response also features what’s known as Perfect Timing, where messages you send only hit a subscriber’s inbox at a time where they’re the most more likely to engage with your message. Use the Time Travel feature to make sure all your contacts in different time zones get their messages at the same time and you’ll be able to optimize your campaigns through the intuitive analytics dashboard. Subscribe below for more great Nonprofit marketing tips, social media and content marketing strategies. Share your thoughts about email marketing for your nonprofit in the comment section below. I’m really looking forward to reading your comments.